Notes: Based on the manga by Hajime Isayama, which was later also spun off into several light novel series as well as a number of video games. A live action adaptation is in production scheduled for a 2015 release, as of 2014. A recap episode was aired mid-season, reportedly in order to give the animators, who had fallen behind with the production, time to catch up. It was streamed on Crunchyroll.com, where it is labeled "Episode 13.5"; the series proper has only 25 episodes, but the recap episode is included as part of this review. It contains no material not seen in the preceding episodes and may safely be skipped if one should wish. A pair of side stories are being released as OAVs, bundled with limited editions of the 12th and 13th volumes of the manga. This reviewer has not seen either, and they are not included in this review. A second season was announced as being in production in late 2014. Although the series has been popular in other Asian countries, it has been accused of promoting a militaristic agenda in some circles. The series gained some notoriety in the wake of a widely-reported flame war, incited by a 2010 blog post arguing that the minor character of Dot Pixis, a general, was based on the controversial general Akiyama Yoshifuru. In the midst of this, multiple death threats were leveled against Isayama. Many years ago, the last remnants of humanity were forced to retreat behind the towering walls of a fortified city to escape the massive, man-eating Titans that roamed the land outside their fortress. Only the members of the Scouting Legion dared to stray beyond the safety of the walls, but even they seldom returned alive. Those within the city clung to the illusion of a peaceful existence until the day that dream was shattered. I often come across as a snob, but what I truly abhor, and what often forms the basis of my seemingly snobby negative reviews, is boredom. Though I entered the anime world out of an interest in so-called "art films" (if you can really make a definition for that) and like to find shows and movies where intellectual engagement plays a part in my enjoyment level, I will give credit to a purely entertaining series when it is due. That brings me to Attack on Titan, one of the most popular series of recent years and one that, given its ubiquity in fandom as of 2014, appears to be on its way to becoming iconic. Like other so-called "classic" series I fear it will reach a point at which criticism is impossible, not because it is devoid of flaws but because such status can make a series immune to being called out on them. Indeed, Attack on Titan is far from flawless, but its popularity, and perhaps even its "classic" status when it does come, are deserved in my opinion. It is a thoroughly entertaining series. Attack on Titan succeeds largely because its world is, if imperfectly constructed, terrifying and grim, such that I couldn't help but feel the hopelessness felt by the Titans' targets and, later, be stirred up by the war against them. In part, this owes to the show's visuals. The Titans themselves, more than being simply large and homicidal, are eerie, with human features but with proportions clearly just different enough from normal humans to be offputting. Their mouths open too-widely, they move in a slight "waddle" that makes watching them incredibly unsettling, and the gaze behind their eyes is simultaneously mindless yet completely horrifying. The arguments made that this show has promoted rightwing political beliefs could certainly be substantiated by this aesthetic choice, but it works wonders in establishing the tone of the show. Attack on Titan is, meanwhile, very violent, but while I would suggest the squeamish stay away, the violence in fact went a long way in allowing me to understand the terror the humans felt. Watching characters be mangled, chewed, and eaten, and seeing the expressions on other characters as they witnessed this occurring, it was near-impossible to distance myself. Regardless of whether I liked or disliked the main characters (and as I will discuss, I did have some issues in that regard), I could always feel their terror during these scenes. To be sure, it amounts to manipulation, but it is an especially effective occurrence of it, and I will give credit to it for giving the show the atmosphere it had. Certainly, the musical score, which is oft-repeated but appropriately intense, contributes, as do the fantastic energetic opening songs, which at this point have become about as popular in fandom as the show itself. I'll also give credit to the show's production staff for using money where it mattered most. 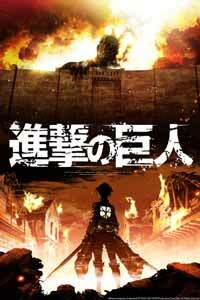 Attack on Titan certainly wasn't a terribly high-budget series, and to the chagrin of the manga's fans, it frequently fell behind schedule; a recap episode was devised to give the team some time to catch up, a move which strikes me as a desperate one. But while static scenes are given over to still shots and to speed lines, the scenes in which the animation truly counted, such as those featuring the famous "maneuver gear" used to swing between houses or trees and fight the Titans, looked magnificent to me. Money was also spent on giving appropriate detail to the backgrounds, which is crucial in a series attempting to establish such an atmosphere; even before the Titans appear, the street cobblestones have the appearance of having seen too much wear and far too much human excrement, and the wildlands in which the Titans currently live are drawn as being especially verdant and biodiverse, highlighting the fact that the Titans bother no other living things besides humans and that they have created such a massive waste by leaving verdant land uninhabitable. An important aspect of Attack on Titan is its grim medieval-esque setting, and it is developed excellently here. It is aspects such as these that allow Attack on Titan to work in spite of its weaknesses, which are certainly there and certainly are not slight. For one thing, Eren himself makes for something of a frustrating protagonist; his seething rages and inopportune exclamations can come across as highly childish, in addition to making him somewhat one-dimensional. I'm certainly not alone in finding him frustrating; friends of mine with whom I watched this described him as being irritating, with one noting that a scene in which he gets away Scot-free with killing a character (a would-be murderer himself, mind you) made him impossible to empathize with. I didn't feel the same about that scene, and regarding his hotheaded personality, in this case I think the circumstances, which far outdo those of most "traumatic backstories" used to justify childish behavior, do provide good enough reason for his behavior that I tolerated him without necessarily liking him. Regardless, he is a polarizing character and is likely to remain so. I certainly liked the secondary leads far more. Eren's friend Armin, written as a sort of "timid sidekick" character, does grow out of that limiting descriptor thanks to some episodes that are devoted to him and his tactical abilities. Meanwhile, Mikasa, probably the show's best-known character, is also probably the show's strongest, I would argue. She is, in my opinion, one of relatively few physically strong female characters who is not written to have a key vulnerability or secret reliance on a male character; while she does care about Eren, she functions fine without him. In part, she has the role of keeping Eren's idiocy within bounds, an aspect that I appreciated, but while this is a common aspect in shonen anime among female characters, I did feel that the series gives her the license to reach her potential that many female characters are not given; considering how enjoyable her battle scenes are to watch, I would say she reaches it. While I would not necessarily go far enough to say that Attack on Titan is "feminist", I did appreciate that it invokes parity in several ways: the army uniforms are unisex, meaning that fanservice is practically non-existent, the female characters are rarely subjected to sexualized camera angles (I was certainly NOT talking about Mikasa's scenes from the viewpoint of one who enjoys fanservice), and positions of power, at least within the army, are roughly split between the two genders. Arguments over the politics of this show, as well as Mikasa herself, are bound to be lengthy and I will therefore hold myself back somewhat, but I personally found her compelling. Still, characterization is not the show's greatest strength, and Eren aside, the primary problem is that the supporting cast is very, very large. This might have been less apparent in the source manga, where it is (perhaps) easier to flip back to a previous page in order to refresh oneself on who a character is, but while watching the anime, it was somewhat difficult to invest myself in some of the characters' problems, simply because I had barely seen them before the drama arose. A common complaint against Attack on Titan has been that its pacing is slow, a point that I would echo somewhat with the modification that it is mismatched: early on, we get approximately two episodes to introduce an enormous cast of characters, and then perhaps 7 episodes total of plotting and planning. There is, to be sure, plenty of action in the show, and while watching it I frequently marathoned four or more episodes at a time out of anticipation, which is something I rarely do. Nonetheless, the show decidedly favors scenes of tactical planning over scenes of character development, and more of the latter was necessary for this cast to make the impact. I think that the show's battle scenes do make up for this failing somewhat, and the tactical scenes, which contain more visual aids and less technobabble than in similar and lesser shows, do remain interesting to watch; nonetheless, for those not familiar with the manga, it is hard to keep track of the characters. If the plot of Attack on Titan is its greatest strength, then one might ask if the plot is flawless. That's certainly not the case, for while I did genuinely enjoy this show's world-building, plot holes can be found if one digs deep enough. There is, for example, the bizarre case of the Titans breaking into the outermost wall and apparently leaving the next outermost wall intact until, conveniently, Eren and his friends have just become members of the army. Relatively little, meanwhile, is explained about how the humans came to build the walls in the first place, or how they were even able, and the show throws in a bizarre detail, that Mikasa and her mother were descended from a small group of Japanese people who made it inside the walls years back, whose significance it never really explains. Now, I certainly am aware that the manga has continued far beyond the point at which the anime is at (the anime, sadly, ends on a bit of a cliffhanger), and so some of this criticism may be irrelevent or become irrelevant as more is animated. Regardless, they don't ruin the show: the plot remains a strength because the show is fabulously entertaining. In spite of how frustrating I found Eren at times, and in spite of my various quibbles, the positive aspects do truly add up to something worth watching. I found it easy to invest myself in it, and that investment was not wasted, as I truly enjoyed the majority of the episodes. My complaints about Attack on Titan are not meant to dissuade anybody from watching it; rather, they prove that the show is entertaining and engaging enough to survive its flaws, at least in my experience. Whether it becomes an enduring classic or whether the hype it saw in the early 2010s will be short-lived, I think its popularity is deserved.